It seems forever since I hailed the new year with promises to post updates about some of the good developments at Old Friends. Has it really been only a month? What a busy time it’s been, a month of the most productive teamwork ever. 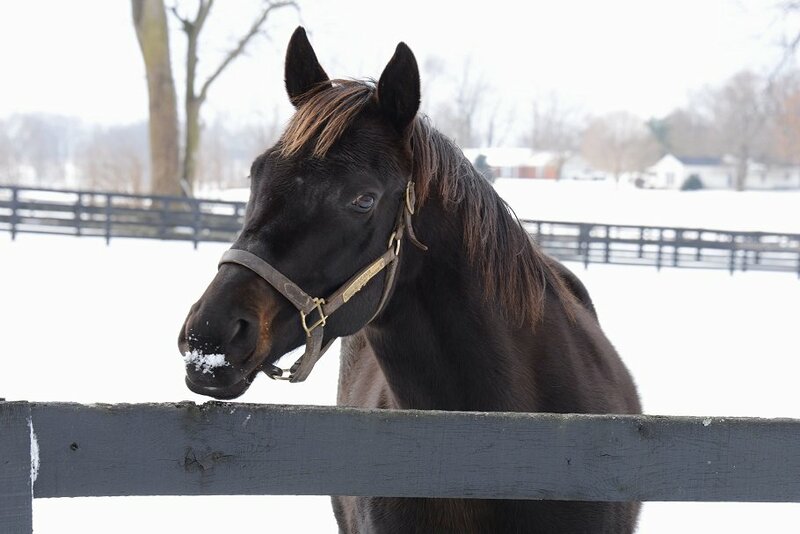 The challenges of a severe winter have been met by staff and volunteers alike, and the horses are thriving. I admit this is one reason I’ve blogged so rarely lately, and why I’m still catching up on the biographies for our new arrivals’ share materials. I’ve been one of a small army that’s been slogging through the snow, busting and clearing ice from waterers, delivering supplements, and helping with horse care. 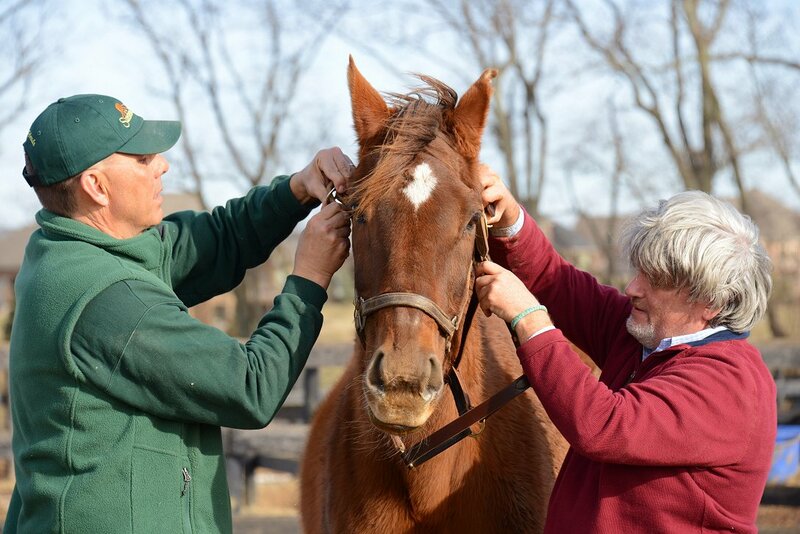 New programs, initiated by Michael and the most progressive, knowledgeable barn leadership Old Friends has ever had, are improving the Kentucky farm’s use of volunteer resources. Those who want to work and learn are doing so as never before, and the horses are benefiting. Here are a few of the wonderful things going on. 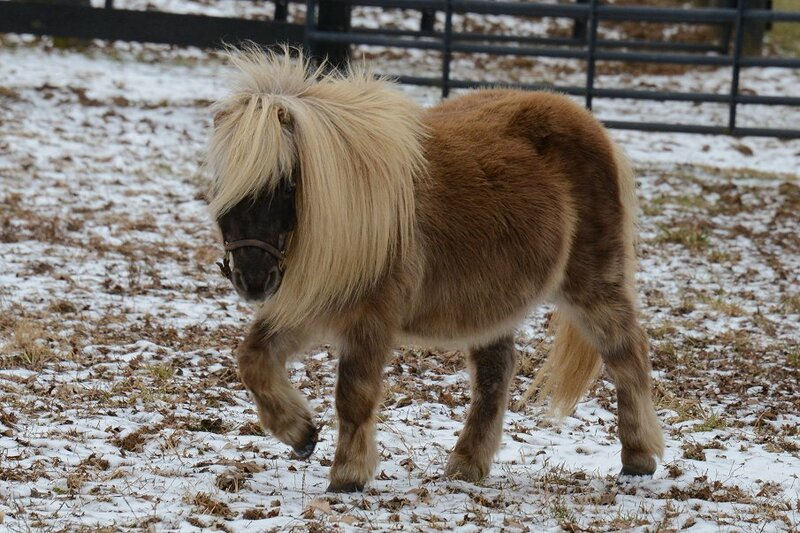 Horses don’t feel the cold weather the same way we do. As long as they’re acclimatized and grow their furry winter coats, their thermoregulatory systems keep them comfortable. But as always, they need water, and plenty of it. 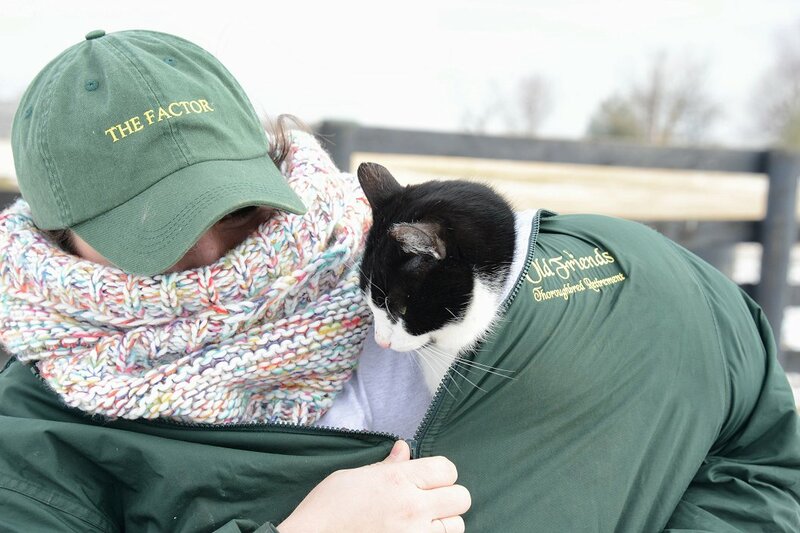 Thanks to our barn staff and volunteers, water has been constantly available to all the horses during the frigid weather. Barn staff whacked the ice at morning and evening feedings, and on sub-freezing days, volunteers turned up, some of them day after day, with hammers and axes to bash the ice at midday. Ingenious tools slowed down re-freezing by scooping the ice chunks out of the water. Nick the fireman has fantastic temperature-proof gloves; some others found kitchen strainers with long handles useful; most all ended up with ice crusting their hair or glasses, but the horses had access to their water no matter how low the temps stayed. When for a few days the water pipes failed, excellent teamwork ensured that plenty of water was delivered to all the residents. The labor involved in all this was not minor, and all who pitched in (you know who you are) deserve praise. The new horses are settling in beautifully. As a routine precaution, at first they were quarantined in the big barn, with separate turn-out. With the approval of our team of vets (they’re great—all either donate their expertise or charge us reduced rates), the newbies all passed quarantine with flying colors. Geronimo now shares a paddock with Bobby Sands and Maybesomaybenot. Areyoutalkintome completes a contented foursome with Commentator, Fabulous Strike and W. C. Jones. The others will soon settle in with paddock mates too. 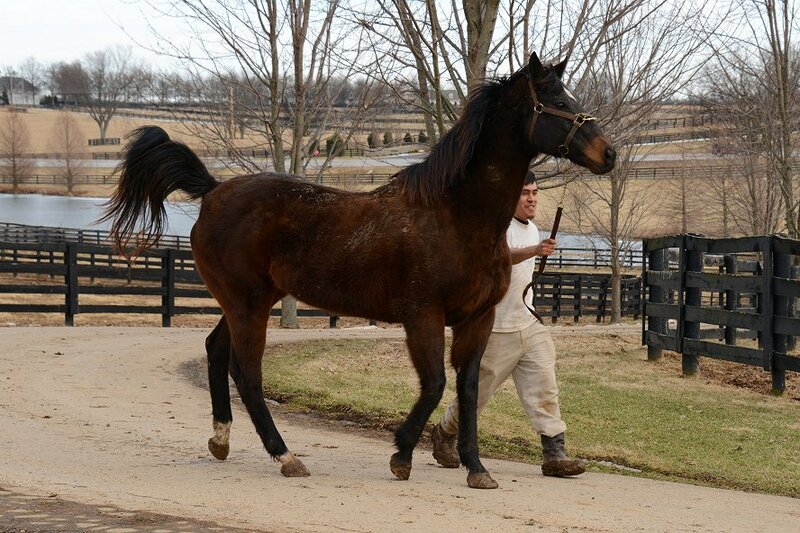 For Johannesbourbon and Star Plus (who’s not so new) that won’t happen until they’ve been gelded, though you can visit all of them and feed them carrots now. 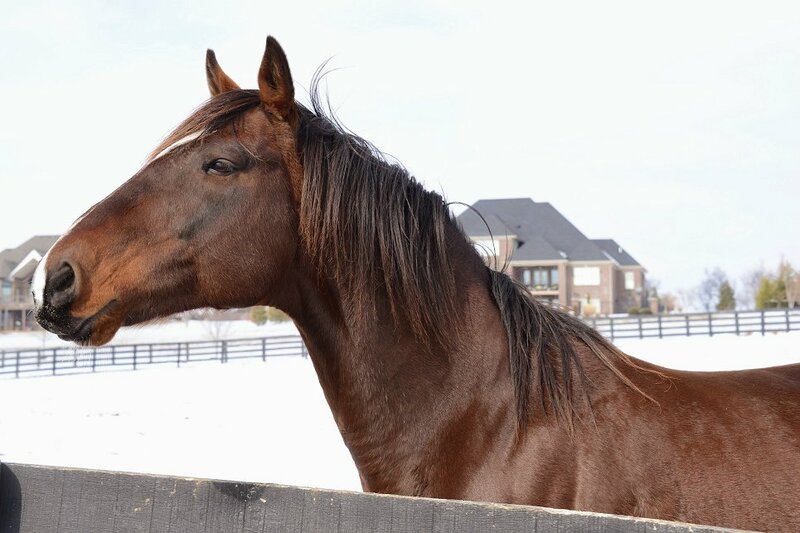 About gelding: as many of you know, a young male horse who hasn’t had a breeding career and won’t have one is best off neutered. 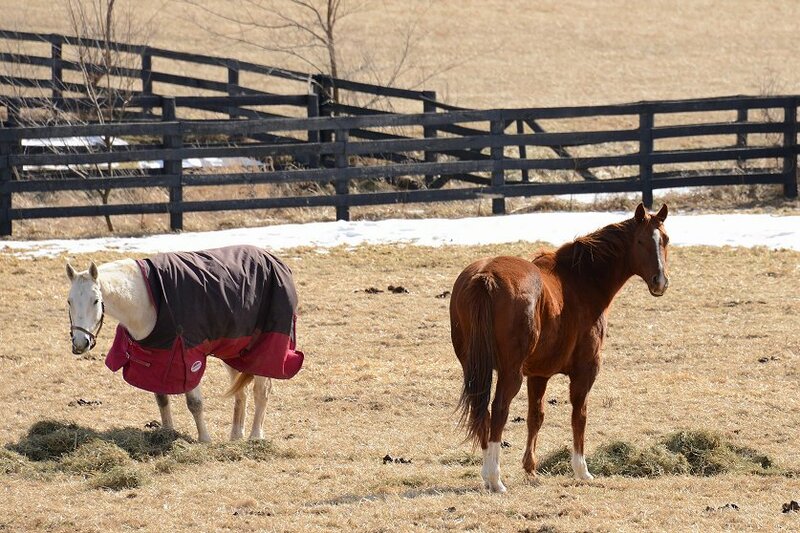 Horses are social animals that feel safest in herds, and geldings can share paddocks. Stallions who’ve had breeding careers are different. Dominant and proud, each wants to rule his own territory—his own paddock—yet stallions do have friendships and rivalries with stallions in neighboring paddocks, like the bond Kiri’s Clown had with his racing rival and neighbor Awad, or the companionable snortings and pawings Swan’s Way strikes up with whoever his neighbors happen to be. Mares don’t have guy-issues about territory. Whether or not they’ve been mamas, the girls enjoy living in herds. 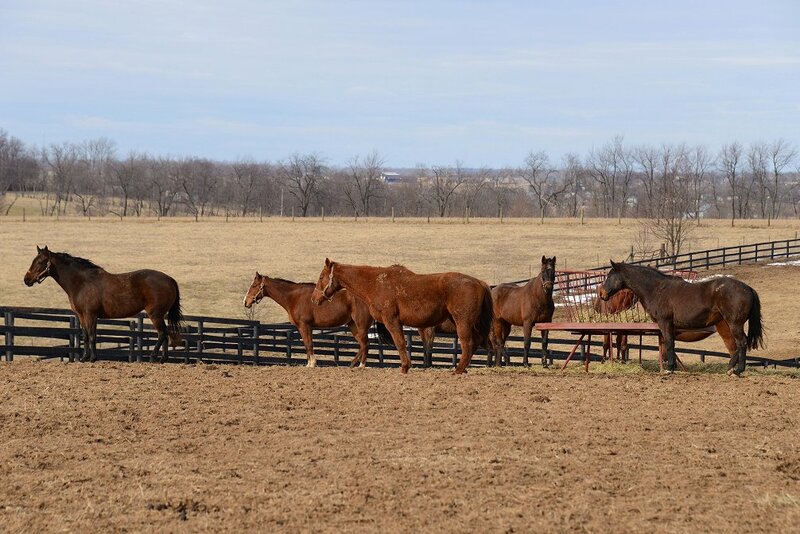 Finding the best combinations for our small herds of geldings and mares is an ongoing project. Who’s happiest sharing space with whom is getting lots of attentive focus. More good news involves supplements. Certain high quality horse care products are recommended by our vet specialists for particular horses, Since supplies have never been unlimited, our specialists, barn management and volunteers are collaborating to improve the availability of our supplements to the horses who can best benefit from each. And on the subject of teamwork, have I mentioned how much we love our generous supplement sponsors, Succeed and Lubrisyn? Check out our web site’s Sponsors page for links to these and other great horse care stuff. Finally, special thanks go to our KEMI students. 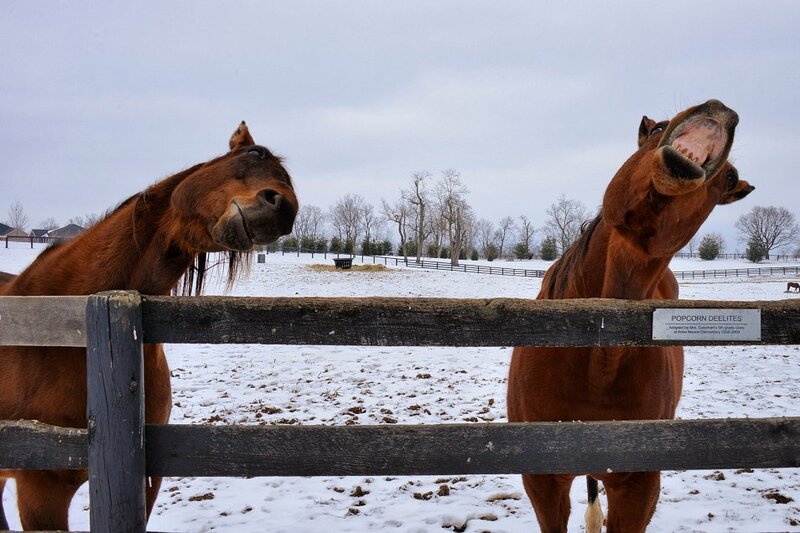 They’re University of Kentucky majors in equine health and business who are devoting some of their already overcommitted time to helping us out. We’ve partnered with the KEMI program for a few years now, and we’re proud to offer our student volunteers meaningful learning experiences. And we learn from our KEMI students, too. Winter isn’t over, but during this respite, with what feel like March winds blowing in, I look forward to spring and the visitors who’ll soon be back in numbers. Between the benefits the TAA grant is bringing and better-than-ever volunteer opportunities (yes, we can use more volunteers!) you’re going to love visiting Old Friends more than ever. 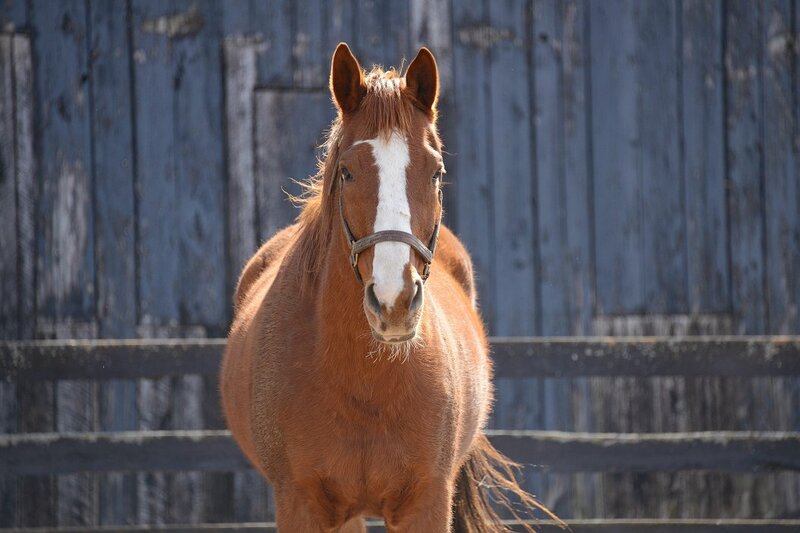 To schedule a tour, donate toward our horses’ care, or talk about volunteering, give us a call at 502-863-1775 or contact us here. We hope you’ll come see us soon!